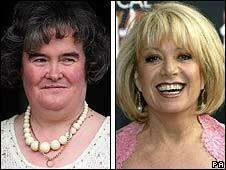 Singer Elaine Paige has paid tribute to Susan Boyle, the Britain's Got Talent contestant turned global phenomenon. "It seems her performance has really captured the hearts of everyone who saw it, me included," said the star. Boyle, a 47-year-old from West Lothian in Scotland, spoke of Paige prior to her rendition of I Dreamed a Dream from Les Miserables on the ITV1 show. Paige, 60, has now returned the favour, describing Boyle as "a role model for everyone who has a dream". "Ever since Susan's appearance on Britain's Got Talent my inbox has been flooded with e-mails," said the actress on her BBC Radio Two show on Sunday afternoon. "Perhaps we should record a duet?" she continued. "I will continue to watch and I hope you make it to the final," she told Boyle. "I wish you every success." Asked by judge Simon Cowell who she would like to be as successful as, church volunteer Boyle cited Paige - a West End veteran whose many stage successes include Evita, Cats and Sunset Boulevard. The performer is one of several public figures who have voiced support for the angel-voiced Scot, now odds-on favourite to win this year's series of the ITV1 talent search. Scottish First Minister Alex Salmond has sent his congratulations, while Hollywood actress Demi Moore said she had been reduced to tears by her performance. Former Labour spin doctor Alastair Campbell has also commented, saying politicians in Westminster could learn much from Boyle's "authenticity". Sunday's tabloids feature numerous stories about the unlikely star, with the People claiming she is to be offered the role of a lonely Australian in a US film. The Sunday Mirror, meanwhile, features an interview with her brother Gerard, who says the young Boyle honed her voice singing along to Donny Osmond records.